Open case made of matted acrylic with the closed book, showing the cover made of transparent vellum which lets the title page shine through. Double spread (p22/23) showing on the right side the DNA Code of the Giant squid which the marine biologist Kubodera Tsunemi could extract after catching one tentacle of the squid. On the left page the diameter of the squid’s eye is shown. First double spread (p2/3) showing the title page and the outlines of the Tokyo bay from where the marine biologist Kubodera Tsunemi started his expedition. Double spread (p8/9) showing the first of the three printed poems on the deep sea fish’s bizarre forms in it’s German original and it’s Japanese translation. Double spread (p12/13) showing on the left side the date and time of the first images taken by Kudobera of the giant squid and on the right side a formula he used to estimate the size of the creature by the tentacle he caught. Letterpress-print in German and Japanese by polymer clichés and vinyl mats in blue, grey and black. Printed on 50 year-old Toshaban-Genshi paper. Illustrated with nautical charts and scientific data on the Architeuthis, provided by Tsunemi Kubodera from the National Museum of Science, Tokyo. Flexible cover made of clear vellum, embossed in black. Box made of acrylic glass. 26°57,3’N, 142°16,8’E – At this location in the northwestern pacific, the Japanese marine biologist Tsunemi Kubodera took for the first time pictures of a living giant squid in its natural environment. I chose this coordinates as the title for this book containing three poems by the Berlin based author Durs Grünbein. Despite being located 900 km south of Tokyo, the Ogasawara islands belong to the administrative district of the capital. Until these first images were taken, all scientific surveys were based on dead squids washed ashore, or parts of them found in the stomach of sperm whales. Their giant size evoked the myth of an aggressive monster. When Kubodera published the pictures he has taken in September 2004 in the Proceedings of the Royal Society one year later this was not only a scientific sensation, but he got worldwide attention in mass-media as well. Inspired by a note in the newspaper, Durs Grünbein wrote a poem titled “Architeuthis” about this discovery. Fascinated by his seven-verse text, this project about deep-sea fish emerged. We chose two further poems to be printed, one – which had already been published – about the bizarre shapes and behaviors of creatures living in such depth entitled “Sous les Mers” reminding of Jules Verne’s Capitain Nemo. And the other one about the legendary fish “Remora” which Grünbein wrote specially for this book. In autumn 2006, just shortly before he caught the first giant squid alive, I visited Tsunemi Kubodera in his laboratory in the National Museum of Science in Tokyo. Surrounded by countless preparations and images of different types of squids, he told me about his discovery and the reactions on his publication, not forgetting to point out his disappointment about the Japanese media that concentrated on the questions if this giant squid is edible and how many sushi could be made out of it. I decided to use the data and formulas received from Kubodera together with some nautical charts as illustrations for the book. When we met, Kubodera also showed me pictures and short films of squids he recorded in depths between 600 and 1.000 meters. On these images, the unpracticed spectator only sees dimly silhouettes of the squids but at the same time starts to sense the diversity of life in such darkness. This gave me the idea to use the interaction of transparent and opaque pages for this book. In search of an appropriate paper, some difficulties arose: a beautiful sample that I had brought back from a trip to Shikoku some years ago, was not available any more, since the papermaker had died and no one succeeded his skills. Finally, I got a bigger amount of old Toshaban-Genshi, a very thin Ganpi paper, which was used to make stencils for Mimeographs. This paper was exactly what I was looking for, on the one hand very thin and transparent, on the other hand so firm that once it was printed with a dark color, it turned to be opaque. It also attracts through a fine and rustling tone. 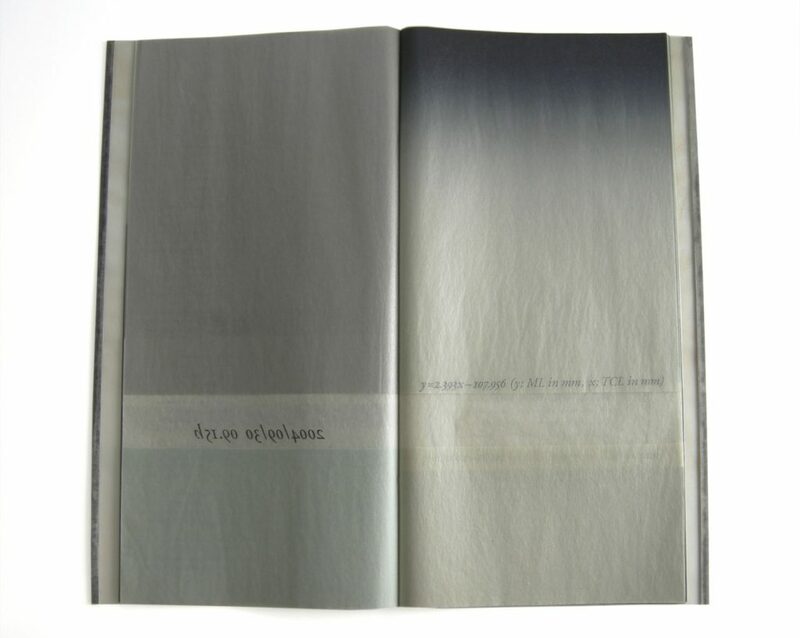 Each page of the book consists of a double spread paper, fold in the front. 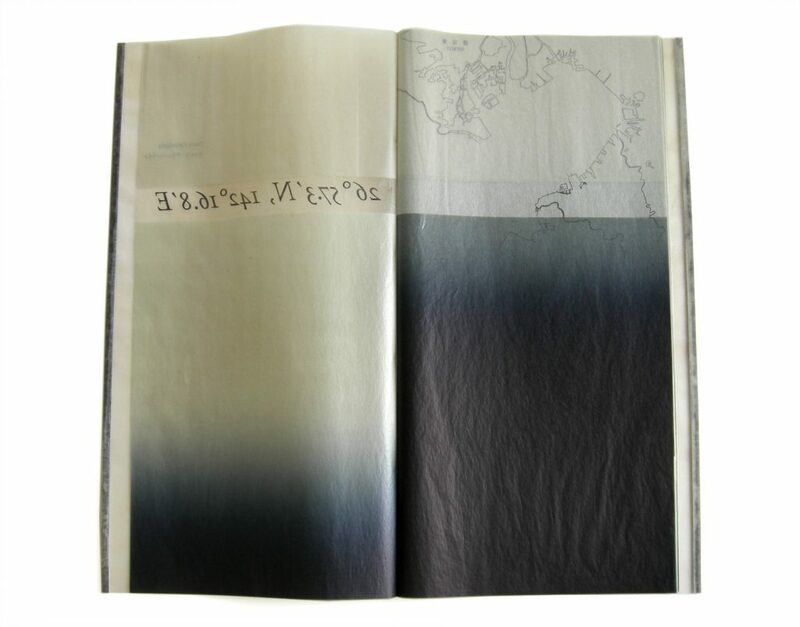 These fold pages are printed completely with a transparent medium, a color ranging between grey, blue, or black as well as transitions of these colors. The pages are cut horizontally, pulled apart a little bit and thus make visible the inserted single sheets. On these sheets, I printed the data Kubodera surveyed, as well as the nautical charts that are often only partially visible. 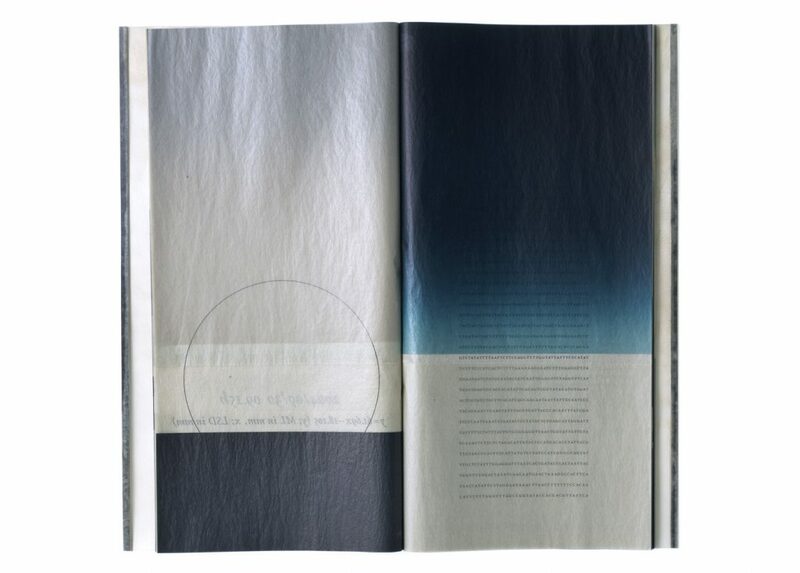 The pages with their stripes remind the reader of horizons and depth contours and at the same time give a glimpse to the normally invisible variety of the deep-sea world as if lighted up with a torch. The first and the last page show the outlines of Tokyo Bay with the fish market Tsukiji. In 1895, for the first time a species named “Architeuthis sp.” was discovered there and described by the Japanese scientists Mitsukuri and Ikeda. The German scientist Franz Hilgendorf, wo described in 1880 a “Megateuthis”, found a lot of his specimens in Tsukiji. The tranquil and colored pages are interrupted by six double-spread pale pages, printed with the three poems in German on the left and their Japanese translation on the right side. According to the coordinates of the place where Kubodera made his images, all periods are replaced by a degree mark and commas are replaced with a minute mark. Yuji Nawata translated the poems into Japanese for this edition. 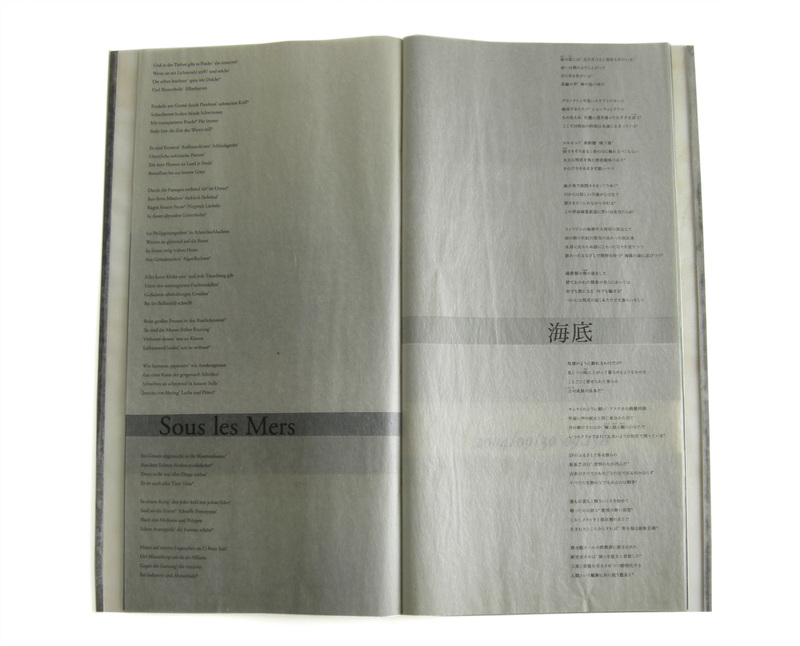 All inserted single pages and the poems are printed by polymer clichés, the colored pages are printed by Vinyl mats. The book is stitched with thin straps of vellum to a flexible cover of clear vellum. 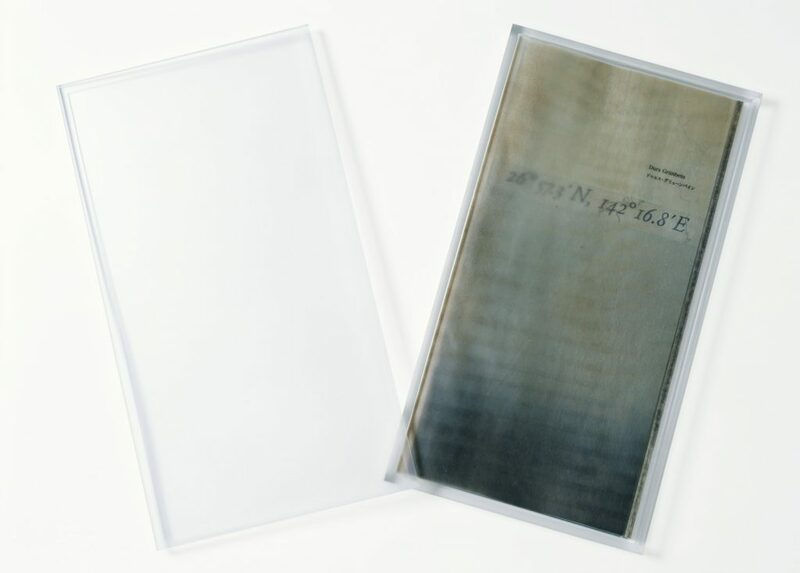 The first page contains the title and the last page with the imprint are visible through the clear material. By it’s natural warping and organic character, the vellum sets a harmonic antipole to the technical image of the inner pages. On the front cover, the name of the author is embossed in small letters. 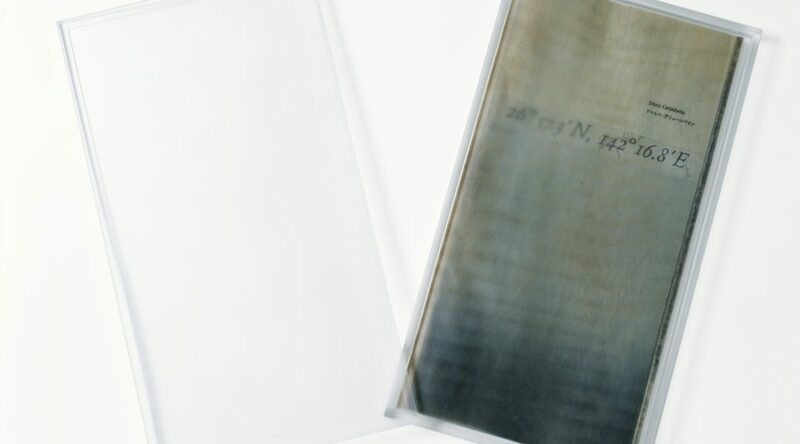 To control the natural warping of the vellum, the covers are hold together with magnetic strips at the leading edge. The book is kept in a compact box made of 8 mm acrylic glass in the style of a preparation. By this it seems to be cast in and the heavy box forms a beautiful contrast to the lightweight and fragile book.